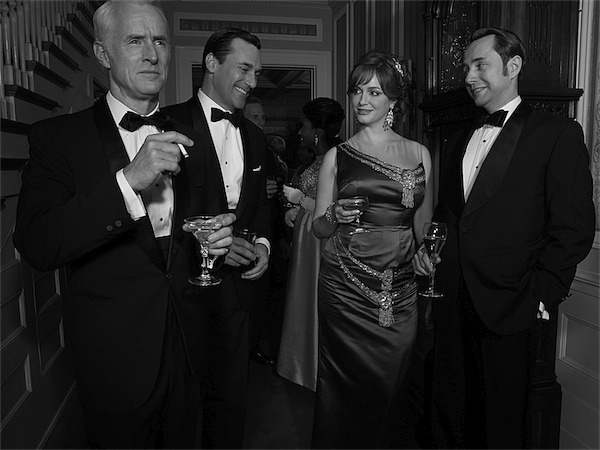 Mad Men will return to AMC on April 7th with its second to last season. The show will boast a two-hour premiere beginning at 9 pm with an episode directed by Jon Hamm. There will be a significant time jump between the seasons. Vincent Kartheiser will not kill himself. Last season marked a shift in the series, with fans either embracing the new Don-Megan dynamic or hating the new faithful-as-a-Golden-Retriever Don Draper that emerged. The last scene of The Phantom showed Don drinking alone at a bar before a young woman approaches him and asks, “are you alone?” We don’t get to hear his answer, and, according to Weiner, that scene plays a significant part in the upcoming season. I can’t believe how much older everyone looks in these promo shots. I for one, want to see what happens to Joan this season. I don’t want her to become a caricature, or become too whore-ish. Despite Joan’s flaunting of her sexuality, she is still able to maintain an air of self-respect that we thought was shattered during last season’s horrific The Other Woman. I want a lot for her character – something unexpected and deserving of her. I’m still rooting for Joan.